A veteran couturier for the past two decades, Tan Yoong might just be the only designer from our local ground to reach legendary status. Known for his exquisite craftmanship and tailoring from his made-to-measure label, which includes a couture bridal line, it should come with no surprise that his main group of clients are attributed with having elegant taste. TSG: What kind of environment did you grow up in? I can recall that I enjoyed drawing from a young age. I frequently used chalk to draw female forms attending different parties in different outfits, as if they had a endless supply of clothes designed for parties. My parents and siblings were very supportive of my choice to do art despite the fact of them having little understanding of the arts. Perhaps it was because I was the youngest in the family. I was naturally attracted to the aesthetics and beauty of the female form (always sketching made-up eyes or lips). As a teenager, I was very much influenced by my sister’s many issues of Vogue and Harper’s Bazaar. I remember David Bailey’s shoots with Jean Shrimpton, Penelope Tree and Marie Helvin, and also the pictures of Irving Penn and Horst. I was fascinated by the compositions in the photos, and it molded my base of aesthetic appreciation. After pre-university, I pursued the arts by enrolling into the Nanyang Academy of Fine Arts. After graduation, I became a graphic artist, because back in those days, aspiring locasl fashion designers were unheard of! Eventually, I went into advertising and I worked my way up to become an art director in BateyAds, which really widened my view to the world of design. It sharpened my skills enough to differentiate and allowed me to strive towards an international feel in all aspects of my work. Till today, I am still applying the knowledge learnt from advertising to my fashion designing. TSG: What was the starting point for you in the arts? How did you know that you wanted to become an artist? I think it is a gift from God. I was always my art teachers’ favourite student. Always excelling in art although I did badly in other subjects. I excelled even in my advertising days when I won top awards in poster design, lettering design, interior design and fashion design. I best expressed my ideas in an artsy way, and I enjoyed and appreciated anything to do with art expression – be it photography, fashion, culture, dance, music, etc. I still do of course! My design aesthetic would be ethereal and fluid, always feminine and dreamy in terms of silhouette and detailing. TSG: Why the move from being an art director to a fashion designer, and how do you compare it to your job as an art director? First of all, I love fashion. Unlike advertising (especially locally because one’s creativity is controlled or dictated by your clients), fashion gives me more freedom to fantasize and dream. I am not a wordsmith, so if I am not in fashion, I would most probably be doing something associated with fine arts, photography, or interior design. TSG: What is the biggest risk you’ve ever taken? To quit advertising and start my own fashion label without knowing anything about the business! TSG: What was the most excited project you had been involved and why? Two fashion design contests I took part in Tokyo in 1974 and 1976 while working in advertising. Those were the only chances I could show off my fashion flair and I was the first non-Japanese to win worldwide! I felt like I was representing Singapore and it was my first trip to Japan, where I was chauffeured everywhere with a lady translator in tow. It was an amazing experience! TSG: You certainly seem to be reaching for the surreal and cinematic effects in your advertising campaigns for your label. What led you in that direction with your work? Did you feel disillusioned with mainstream fashion photography? I am very much a dreamer. I like to think about a woman in different moods and situations. I try to break free from repeating my works and to achieve a cosmopolitan appeal to my designs. TSG: Do you like the models doing typical model poses when you are directing the shoots? In the beginning, the models called me a professional bone-breaker, because I put them in impossible poses just to be unique! Nowadays, I want them to be natural, but still portraying a certain character in a story. Of course, it has to show my clothes in the perfect angle. TSG: In your opinion, what’s a designer’s role in the current economic climate? I think designers have to work more magic to attract. What’s the balance between refining the signature of the house each season and doing something new? It seems there’s tremendous pressure now to do something completely new every time. Yes, it’s not easy to achieve the balance to please your followers and to attract new customers. TSG: In five words, what does beauty represent to you? Anything that pleases my eyes. TSG: What other artists do you admire in your own field of work? Currently, I admire the design sensibilities of Alber Elbaz for Lanvin, as well as the Mulleavy sisters from Rodarte. Though, my all-time favourite is definitely still Christian Larcoix! TSG: What was your most memorable work experience? One of that moments has to be collaborating with photographer extraordinaire, Willie Tang. It is the way he shoots. Always inspiring and demanding perfection, whether it is from the models, the stylist, the setting, basically everything! He has influenced my works and creative vision to higher standards; to try and view the ideas with perfection. TSG: What makes you laugh? I laugh easily, I love sharing my laughter and joy with close ones. Although my friends always tease me about having a fierce exterior demeanour. TSG: What are you working on at the moment, and what future projects do you have? For the year end, I am preparing the looks for my campaign, and I am exploring the idea of a film for that collection. TSG: Do you have any advice for young people who would like to start a career as a fashion designer? No advice, except that they need to have a lot of passion and patience, and be very focused on their work. We’re very pleased to announce that our regular contributing editor and photographer, May Lin Le Goff, has been named the winner of Canon FSO Fashion Photography Challenge 2010. Over 1000 entries were submitted for this competition. Obtaining the highest votes and beating 30 other finalists, May Lin Le Goff has been awarded first place! Thank you very much to everyone who sent in SMS votes & supported May Lin Le Goff. Heres a look at the winning entry again. 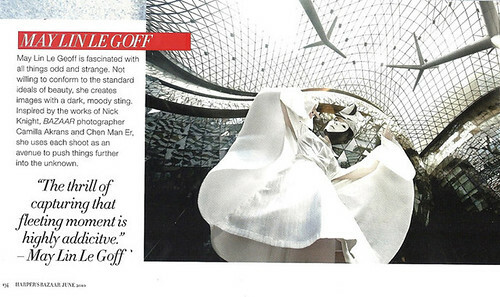 In other news, TSG’s entry to the Harper’s BAZAAR & ION Orchard Photography awards has been given an honourable mention in the June 2010 issue of Harper’s BAZAAR Singapore. We’d like to thank Max Tan of label max.tan, who specially customized a millinery design for us for the Harper’s BAZAAR awards. 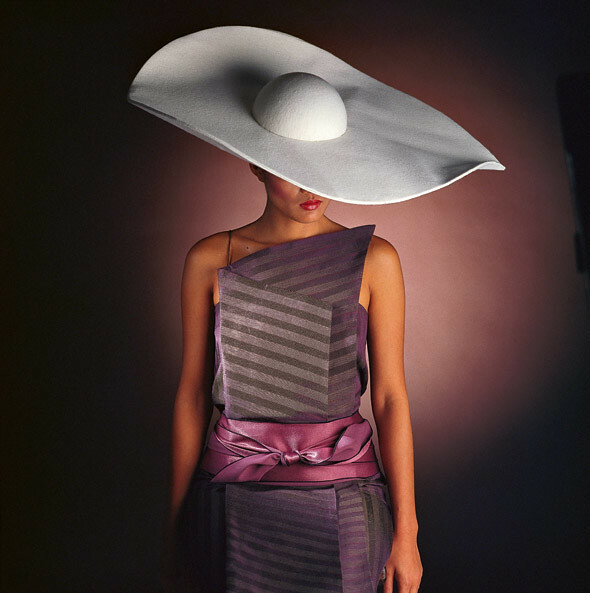 Drawing inspiration from the flow of lines of the ION’s exterior and Serge Lutens’ campaign work for Shiseido in the 1980s, we attempt to meld fashion, art and architecture in our series of images.